Every day brings another story of the brutal impact of benefit cuts. You might think that we would be developing compassion fatigue. That this has not happened is a testament not just to a fundamentally caring society, and the realisation that the next victim could be closer to home, but also to a recognition that none of this is inevitable. The destruction of the welfare state, and the exposure of the working class to unregulated market forces, is a deliberate policy that can and must be resisted. It is this recognition, as well as the very widespread impact of the attack on welfare, that has ensured that the call to end benefit cuts has risen up the political agenda. That call has always maintained a central place in Independence rallies, and has always received a warm response from people who want the opportunity to prove that we could organise things better. If we want to change the system, the first step is to understand what is happening. Despite the scale of the cuts, these were never primarily about saving money, and some of the new practices cost more to run than they save in benefit. The motivation behind ‘welfare reform’ is the achievement of discipline and control in a low-wage little-regulated economy. It attempts to make unemployment so unpleasant that people who are unemployed are forced to take any job regardless of pay and conditions, and people in work are afraid to do anything that could put their job at risk. And it distracts from problems with the system by putting all blame on the individual, who has ‘failed’ to find work or to manage their poor health or disability.The benefit system has become not so much a source of security, but a focus of fear that security will be withdrawn. This is a fundamental attack on the nature of our society, and it needs to be resisted at all levels. The basis of resistance is support for and solidarity with those facing the brunt of government attacks. For us in the Scottish Unemployed Workers’ Network, activity is rooted in our weekly stalls outside the local jobcentre in Dundee. (We have previously run stalls in Glasgow and Paisley too.) Our method of work is very simple. We give a Know Your Rights leaflet to everyone going in, and we ask everyone coming out if they had any problems. We provide a sort of welfare-rights-sans-frontière. We reach people who mightn’t get to office based organisations, and we are also able to accompany them into meetings and assessments as needed. This is about solidarity and mutual support as much as advice. Most of us are veterans of various DWP schemes, and we try and encourage the people we support not just to stand firm themselves, but to join the fight against the system that is attacking them; we won’t pretend that’s easy. We need to be more than a sticking plaster. The point is to expose and attack the source of the carnage, which we try and do through both publicity and political action. Our grass-roots activity keeps us appraised of the twists and turns of DWP policy, and also of their human costs. We use our blog (with all cases anonymised) tomake sure that a wider public is kept aware of what is happening and how the worstimpacts can be minimised. And we make sure, in this and other writings, that we combine our accounts with analysis of the bigger picture. We speak on this whenever we can at public meetings, but some issues need a bit of extra publicity, when some judicious direct action can prove useful. 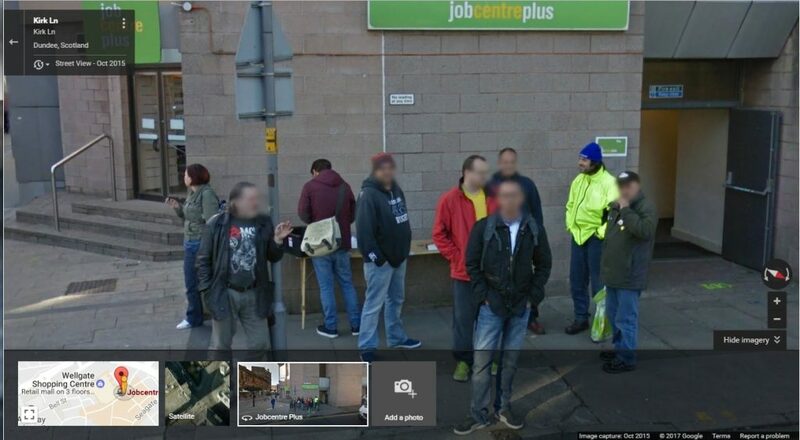 Did our occupations of Work Programme Providers help play a small part in the demise of this particularly cruel exercise in harassing the lives of the unemployed – as well as producing the memorable newspaper headline ‘Masked Gang Storms City Centre Office’? Did the actions of activists across the UK in exposing businesses and charities who were benefiting from exploiting unpaid labour through work-for-your-benefits schemes speed the demise of the Community Work Programme? Did chronicling and publicising the slap-happy sanctions regime in Scotland’s ‘Sanctions City’ of Dundee, help bring down the sanction rate? 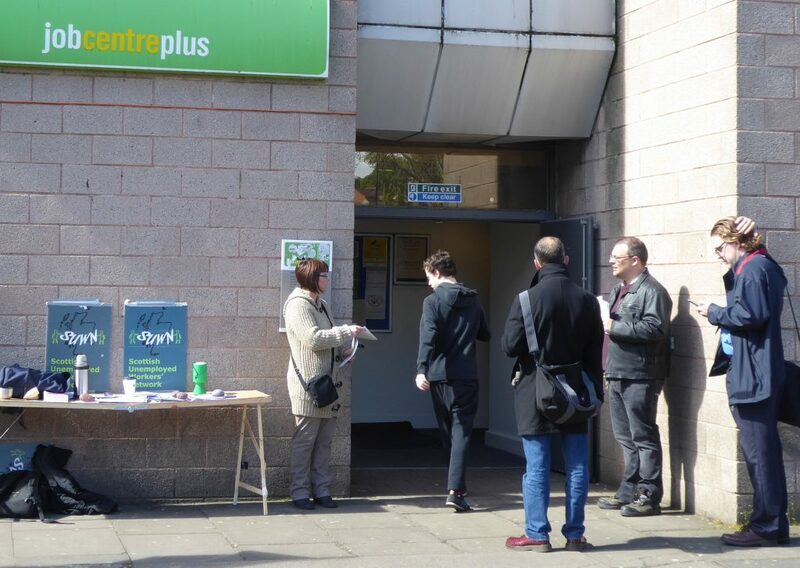 We certainly know that our stalls outside Dundee jobcentre convinced the council to get the DWP to accept welfare rights advisors inside, because they said so publicly. All these small victories are important in themselves and help keep the whole sorry regime in the public eye, but we have seen how the government responds to setbacks in one area by moving sideways and attacking another. At the same time as keeping up pressure for every small reform, we need to build support for fundamental change to the system. The escalating interest in Universal Basic Income is a very welcome development and we will work to help ensure that any proposals are based on decent payment rates and are not seen as an excuse to reduce public services. It’s not just about protest. We try and engage with any politicians who will listen and have submitted our views to Scottish Government welfare consultations. The argument that an independent Scotland could do better has received a boost from their approach to the small part of the benefit system that is being devolved; but – and for many people this is a vital omission – the changes to PIP (the disability benefit) will take a long time to implement and nothing is being done to ease the situation meanwhile. So, while we call for a vote for the SNP on 8 June, as the only party that is anti-Tory and pro-Indy and electable under first-past-the-post, we will keep up the pressure for them to do more with the powers they have. In fact we have always argued that this is not only important in itself, but the best way to makethe case for more powers. And we will continue to make sure that the demand for a better system is right at the heart of the case for Independence. A Pip form to fill in within 2 weeks from when posted, passport checks, and then expected to do a 60pg form by hand in 2017 and rhen the usual threats of loss of benefit. This is really being done its not a Monty Python show but an examplw of war on the defenceless to kill off those who are sick and disabled by this damn tory government. So much for compassion and goodbye to your 13% a year ni contributions. You stated that this book is free when in fact they charge £10 plus £4 shipping. People like my daughter who were given benefits for life still have to go through the PIP assessments. They were given a lifetime award for a reason- they are never going to improve, so it is soul destroying for them or in my daughter’s case, us to have to go through the whole depressing questionnaire again,of course focussing on the worst days to make sure our ‘compassionate’Tory government doesn’t somehow manage to effect a miraculous recovery meaning that she could somehow look after herself for the first time in her life.